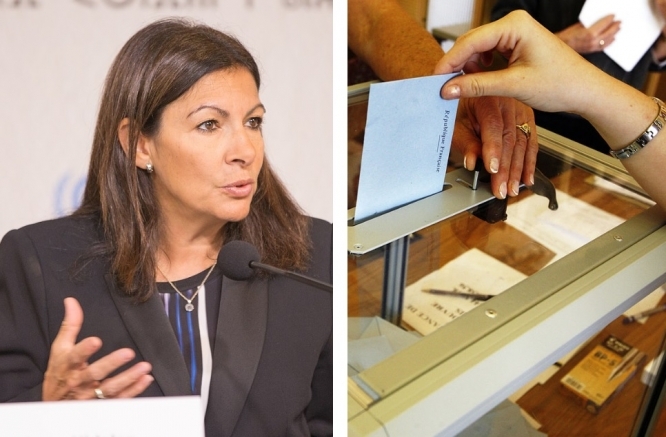 Women4Climate / Rama / Wikimedia Commons / CC BY 2.0 Anne Hidalgo has worked with Sciences Po to set up an experiment that will allow 16-year-olds to "vote"
Writing in Le Monde newspaper this week, Ms Hidalgo said that she was in favour of allowing 16-year-olds to vote in general. The experiment, created with social sciences university Sciences Po, will allow young people aged 16-18 to “vote” in real-life conditions, just a few days before the real European elections on May 26. A dozen young people will be enabled to vote using real voting slips, in real isolated voting booths, in the same way as adults aged 18 and over. These will be set up at the students’ current schools. They will then have a chance to cast a vote on their chosen candidate in the European elections, exactly as they would if they could legally take part in the real event. The results of the young vote will then be counted, and published. Yet, this will only take place after the real European process has finished, Ms Hidalgo said, and the votes will not be counted as part of the real results, so that they “do not interfere with the official election”.